Pam from Scrap n Sew Granny and I will be hosting this fun event. We invite you to come and join in the fun. using the Bear of the day. There will be a new linky each day for that days bear. If you are coming in after day 1 and want to go back and link up on any of the other days we would love to have you do so. I have for you today a step card. I wanted to enter a color challenge so this is what I came up with. So come on drag out the cartridge and join the fun!!! Super cute card and fun challenge. I just love the Teddy Bear Parade cartridge. I just haven't used it too much! Hoping to play along! This is so stinkin cute. I really like the colors and the dots you made. I have ahas TBP for awhile and have not used it yet - maybe this will be the inspiration!! Wow this is just a fun series to do. I like the glossy accent used on your bear clothing. Just too cute & Thanks for visiting my blog. I really like his glossy polka dots. This is adorable!!! Love the step card and cute teddy bear!! This is so fun! 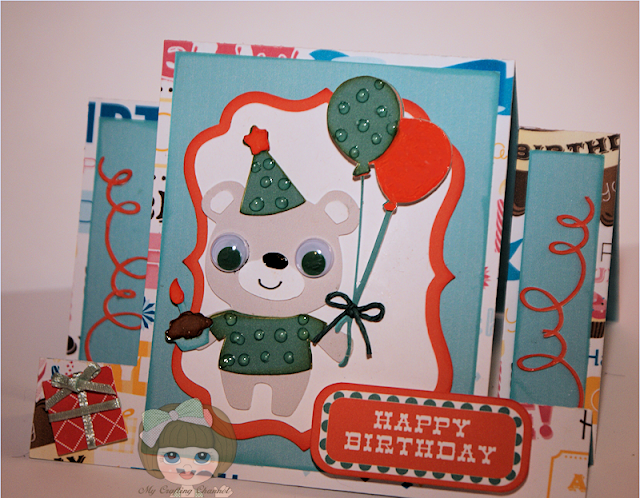 I just love the shape of the card and the fun way you used the Glossy Accents. Another adorable Bear Nana, I love the bright and cheerful colours. This is fun! I'd better get busy! Love your card! Great card. Thanks for linking up at my Just Because Linky Party. He is ADORABLE!! The colors are very Yummy!! Fun card! love it!!! This is so cute!! I love his googly eyes and the glossy accent dots!! Adorable card Nana! The google eyes are so fun and I love how the glossy accents look! Thanks for playing at My Craft Spot! Awww...so cute! LOVE the wiggly eyes! SOOOO glad you joined us this week at My Craft Spot! SUPER FUN CARD, NANA!! Thanks for posting on my FB page! How fun!! Thank you so much for joining us at Craftin Desert Divas “Anything Goes“ Linky Party. Your step shaped card is awesome! Love the googly eyes and the bear couldn't be cuter! So cute my friend! I have been having a great time playing with this cartridge. I was lucky enough to pick it up last winter when I was visiting Arizona. It never did come to Canada and it was one of those cartridge that I just had to have to put on my shelf with the rest of my collection. Now because of you I have a reason to play with it. Thanks for all your wonderful inspiration.